On the weekend of July 24, I went to Adelaide. The response to the In Bed Project in Adelaide was massive and unfortunately I didn’t have the time to visit everyone. These two clever women, didn’t let that stop them from being part of the Project. They emailed me their story and this awesome pic. 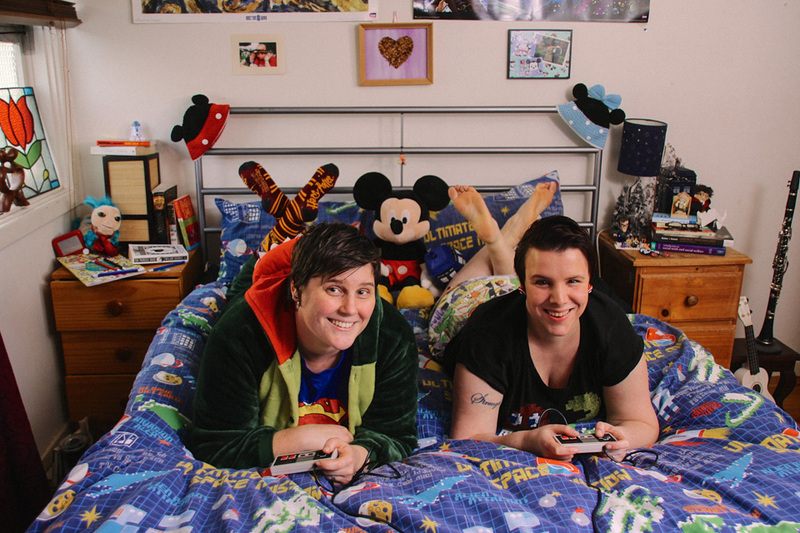 If you would like to be part of the worlds first ever Bed-In for equality you can follow their fine example… simply email your story and pic here. We are immersed in whimsy. I think our somewhat serious daytime roles mean that our home has unintentionally become a haven of all things colourful and positive. We are a couple who complement each other and embrace our differences – just like the millions of others out there. Neither of us had ever known that being in a relationship could come so easily; we had each been with people in the past and assumed that the hurdles we’d faced then had been the normal lows that couples come across. After the first few years flying by, however, we realised that once you truly find the person you’re meant to be with, you take lows in your stride. We have achieved more together than we’d thought possible. I don’t really see us as ‘a lesbian couple’, I just view us as two people sharing their lives together. We don’t support Gay Marriage, we support Marriage Equality. Gender is circumstantial when it comes to love. We love each other for who we are, not what we are.